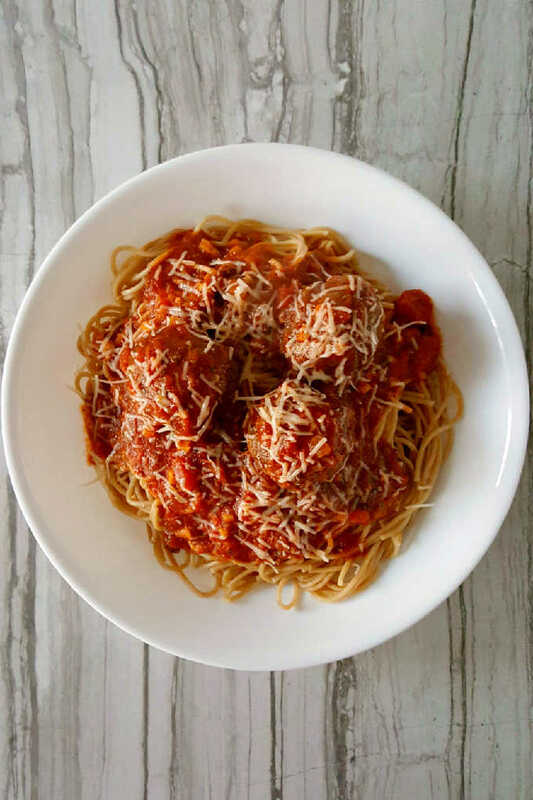 Grilled Meatballs and Spaghetti is a twist on the classic family favorite. Grilling the meatballs brings a smoky flavor to this spaghetti and meatballs you wouldn’t expect. Sometimes I know my husband thinks I’m off my rocker. This is one of those recipes. He read the menu. “Grilled meatballs and spaghetti?” Yup! Grilled meatballs. You see, I was inspired by the cevapi I had in Bosnia. Since then I’ve been drooling over other types of ground meat recipes that are grilled like kofta and what not. These recipes got me to thinking about other ways to grill round meat than in a hamburger. Don’t get me wrong. I love a good burger. But, you know me. I’m always interested in the new and different recipes that I can come up with. Take these onion bombs for instance. I know he thought I’d lost it with these, too, until he tasted them. Then he was all for making them again. He definitely was NOT all for making these again. I was because thought they were delicious! I loved the smoky flavor that grilling the meatballs gave the dish. It would work well with a sauce made with fire-roasted tomatoes. Can you imagine? The smoke from the grilled meatballs and the smoke from the fire roasted tomatoes? Oh. Now I have to make that recipe. A word of caution with these meatballs. The hubs said they weren’t that easy to turn over and to be careful. I personally think that he didn’t oil the grates on our grill well enough, but that’s just me. It could also be that I used a really lean ground beef and there wasn’t enough fat to keep them from sticking. So, there’s that, too. But don’t skip grilling them. It just wouldn’t the same meatballs and spaghetti if you didn’t. They’d just be REGULAR meatballs and spaghetti. Which is kind of not the point of this post. This post about something interesting and different. And these are interesting and different. I was thinking about what other recipes that are usually baked that could be grilled. Meatloaf? Have you grilled meatloaf? CAN you grill meatloaf? I don’t see why not. I mean, it’s just one giant hamburger, right? Who says you can’t grill it? My husband probably. Seriously. Just look at those meatballs! How can you even think it’s not a good idea to grill them? Those grill marks that char; you just know they’re going to be packed with delicious flavor. It also helps that I seasoned the meat with Italian herbs and spices. That way I was assured amazing flavor in every grilled meatball bite. Then you simmer them in the sauce just a little bit. I mean, you don’t want your dinner guests or your family to know that you’ve grilled the meatballs. You want it to be a surprise. One of those “what IS that flavor” moments you relish in. I relish in them. Don’t you? Is it time for dinner yet? I think I need to make these again. 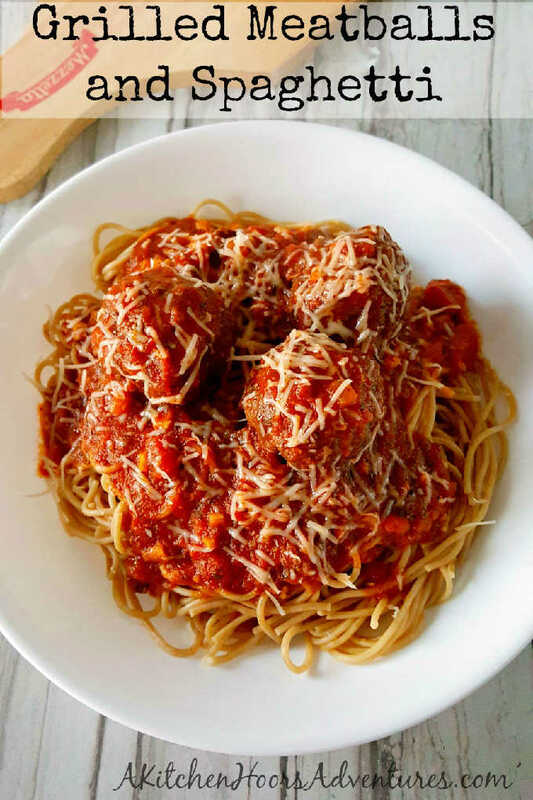 That pile of meatballs on top of that spaghetti is making my stomach growl. GROWL I tell you! I think we have some hamburger in the freezer. That’s it! I’m totally making this this weekend for dinner! I can’t wait to have it again! What’s the strangest thing you’ve grilled? Make sure to see what the others cooked up for #BBQWeek! Combine first six ingredients (ground beef through salt and pepper) in a medium mixing bowl. Using your hands, fold the ingredients together until combined. Roll out into 24 meatballs about 1 to 1 1/2 inches in diameter. 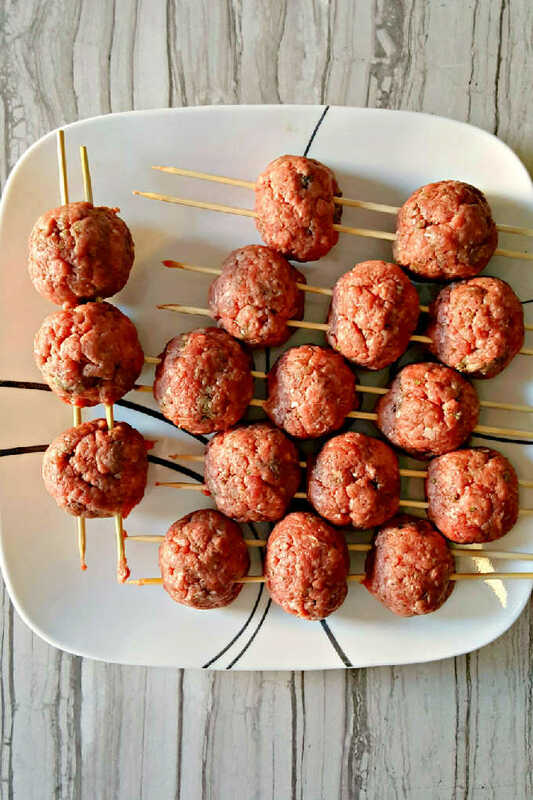 Place a skewer through the right side of four meatballs, then run a second skewer through the left side of the meaballs and place on a plate. Preheat grill to high and grill 3 to 4 minutes on each side or until almost cooked through. While the meatballs are grilling, cook the pasta according to package directions omitting the salt and fat. Place the sauce in a large skillet on medium heat and bring to a simmer. When the meatballs are almost cooked through, remove them from the grill and place in the skillet turning to coat in the sauce. Allow the sauce to continue to simmer until the meatballs are coked through. Divide the pasta evenly between 6 plates. Top with one skewer of meatballs and sauce. Garnish with Parmesa cheese and serve with garlic bread. Never through to grill meatballs, but it’s a great option for warm weather, instead of heating up the house. They’re so good! I hope you try them. This is such a fu twist and I can see it adding a great flavor. Oh my gosh, these sound amazing! 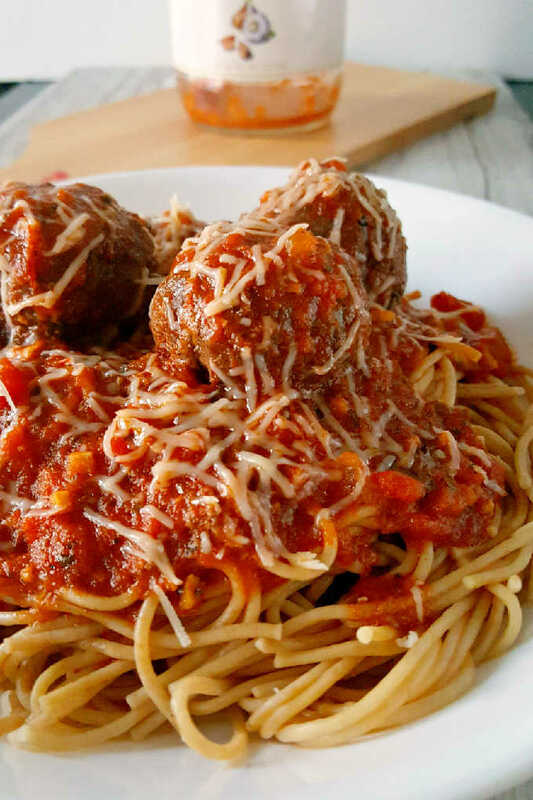 I love spaghetti and meatballs, it is my favorite meal. I am going to try this on my heathens, hah. They are going to love them. Thank you! I hope you enjoy the grilled meatballs in this dish. They’re so delicious and interesting. You should try it! The grilling makes such an interesting flavor. Okay. That’s a good one! Grilled chocolate chip cookies. I have got to try that. The double skewers do make them easier to grill. Such a creative use of the grill! I cannot wait to try this! Grilled meatballs?!?! You are a genius, Christie. Thanks for sharing. These will be on my to-cook soon. Thank you! They’re super delicious and makes the traditional family dish definitely different. Well I wasn’t expecting that idea! How fun and creative! and on a hot night, to cook everthing outside? Yes please! Thank you! It does keep most of the heat out of the kithen. I can see how these would work. 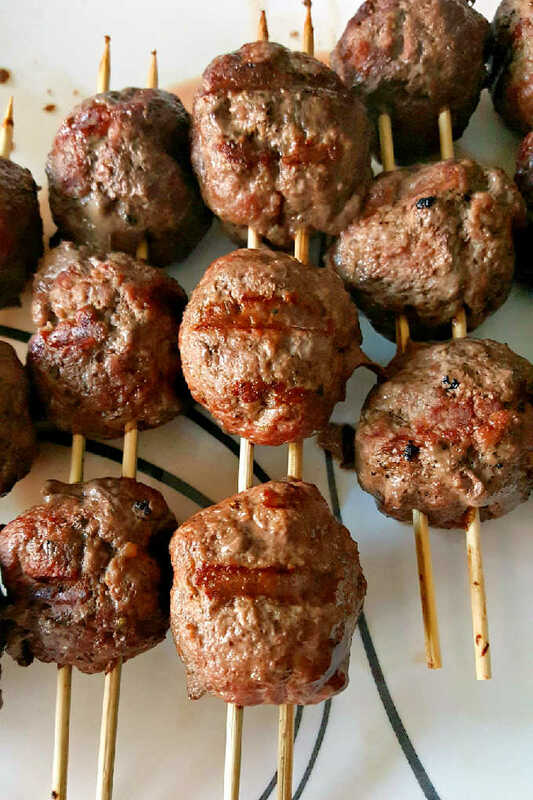 I make grilled gyro kebabs using ground lamb and they are wonderful. Exactly! That’s what inspired me to make these. Hahahahahaha. Grill pan? It’s good to know I’m not alone in this. What a great idea to grill meatballs! I bet the flavor is amazing. It is! You should try it.